This manuscript contains several works, including a collection of recipes, charms, and surgical operations by John of Arderne; a series of drawings of medicinal plants; and a Middle English translation of a Latin medical treatise. John of Arderne (1307-1376) was the first English surgeon to achieve national and international fame. He attended English troops at various battles in the Hundred Years War, which gave him the exceptional opportunities to treat injuries and to study corpses anatomically. Compared with the pictures in most earlier medieval herbals, these drawings are extremely naturalistic. 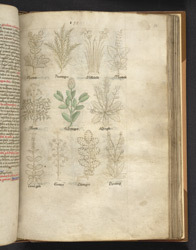 Among the well-known plants on this page is the daffodil, labelled 'Affadille' (top row, third from left).